Historically, Unitarianism and Universalism have long shared a commitment to social justice and peace. (See Commitment to Social Justice on this website’s page, “History of UU.”) This commitment is very much alive today, and it is part of the reason that some members have joined our congregation. 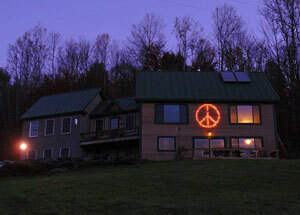 World peace is an ongoing concern for our congregation. Members have demonstrated locally and nationally. 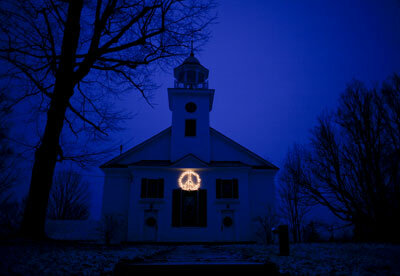 Two member families even have illuminated peace symbols on the sides of their homes, like that which has occasionally appeared on the Church itself. Only gestures, perhaps, but they make it clear where we stand. A number of individuals and families are involved in national and international efforts to better living standards and equality around the World. The Church undertook a huge effort, for such a small group, in raising funds to build a water cistern in a small African Village. We even sending two representatives to oversee the construction project. (See Benin Project.) Some members of the congregation are actively involved in the Zienzele Foundation, a locally-based organization supporting those who care for orphans in Zimbabwe. Almost all members of the congregation participate in the UUA Service Committee “Guest at Your Table” fundraiser. Our congregation is always seeking ways to work for world peace, international understanding, tolerance and social justice.